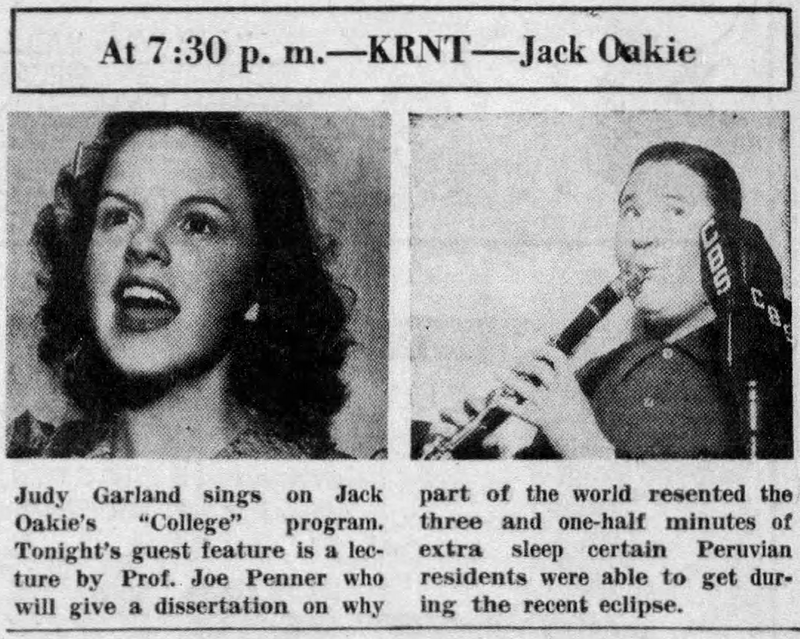 June 15, 1935: A fateful event in the life and career of Judy Garland. She and her sisters, as “The Garland Sisters,” were appearing at the Cal-Neva Lodge in Lake Tahoe, Nevada. 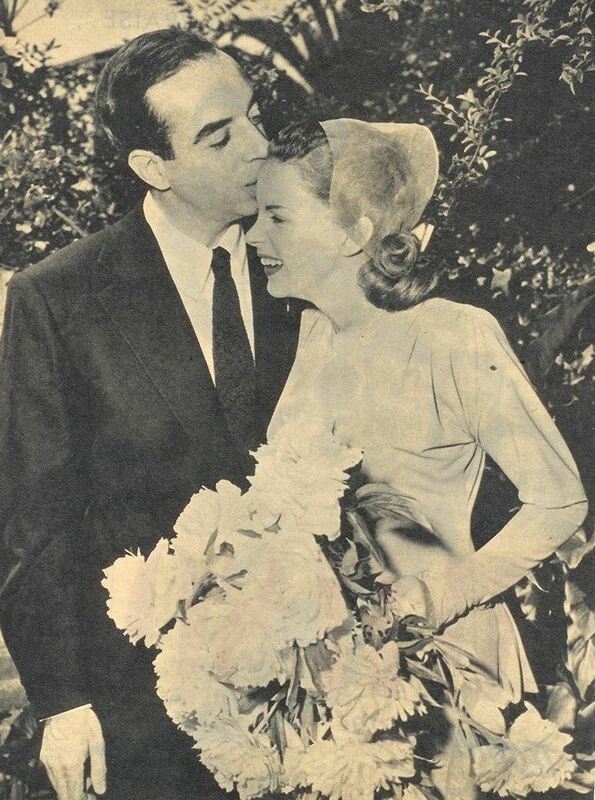 It was during this engagement that Judy adopted the name “Judy” as her stage name. She had been going by her birth name, Frances. 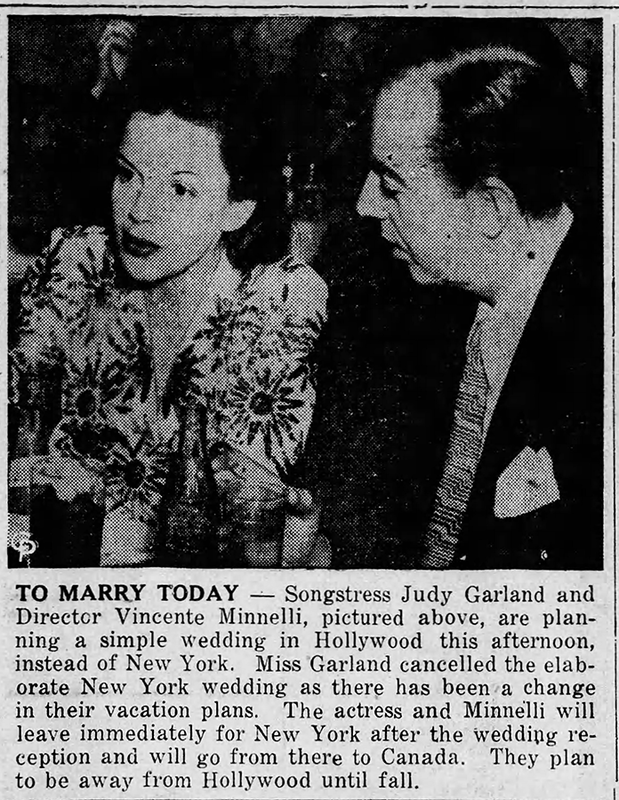 The agent Al Rosen was on hand and would be partly responsible for Judy’s successful audition at MGM that following September. 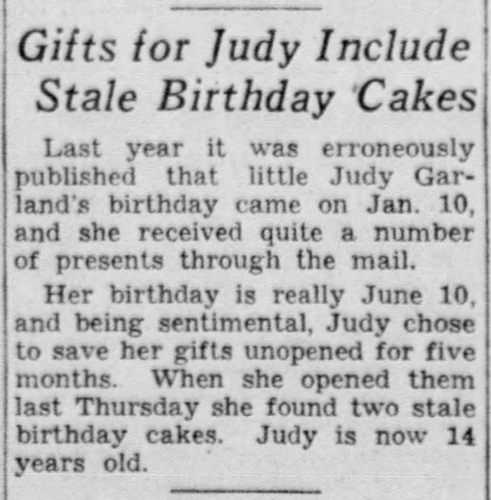 The note below was also published on this date, telling the story of how Judy received birthday presents in January so held onto them until her real birthday, only to discover two stale birthday cakes. 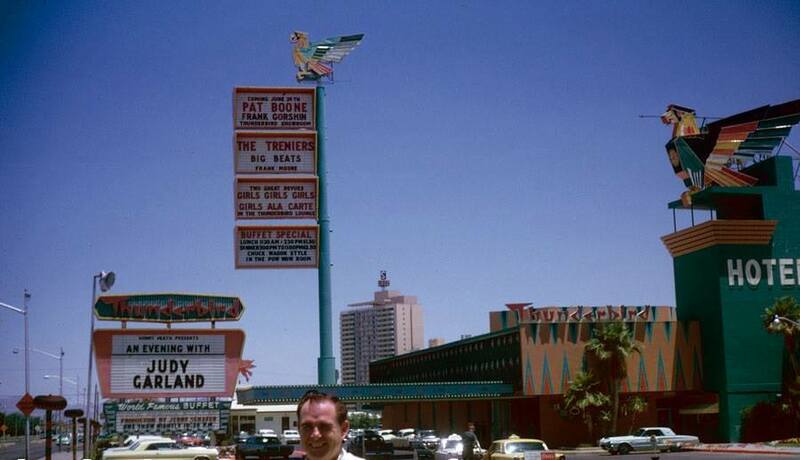 The MGM publicity department was certainly creative! 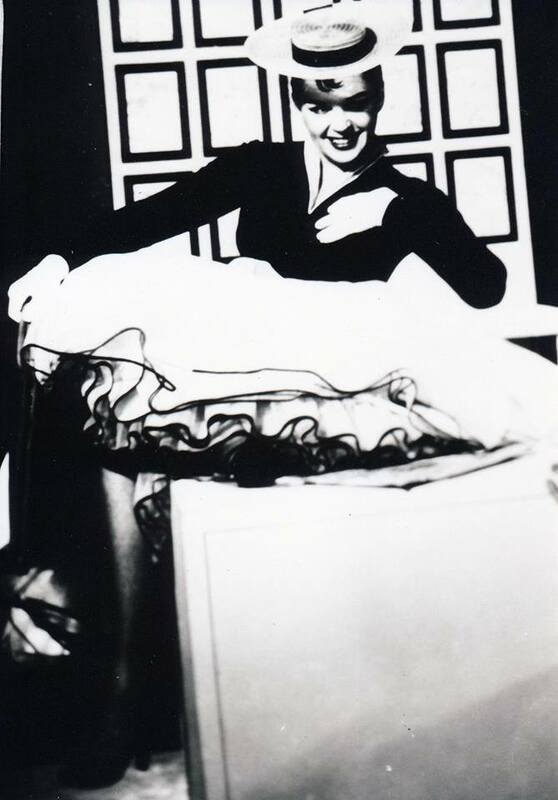 June 15, 1939: Babes In Arms filming continued with scenes shot on the following sets: “Interior Barn Theater,” “Rosalie’s Dress[ing] Room,” “Night Interior Palace Theatre.” Judy wasn’t in any scenes on the last two sets. 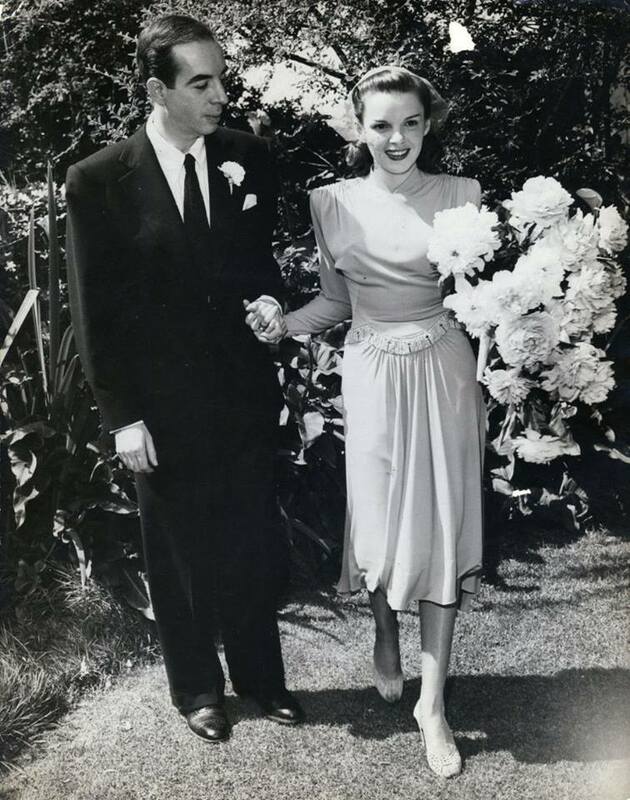 Time called: 9 a.m; lunch 12:20-1:20 p.m.; time dismissed: 5:40 p.m.
June 15, 1941: Judy’s engagement celebration (to her first husband, David Rose) was attended by over 600 guests at Judy’s home. The event was covered in the fan magazines. 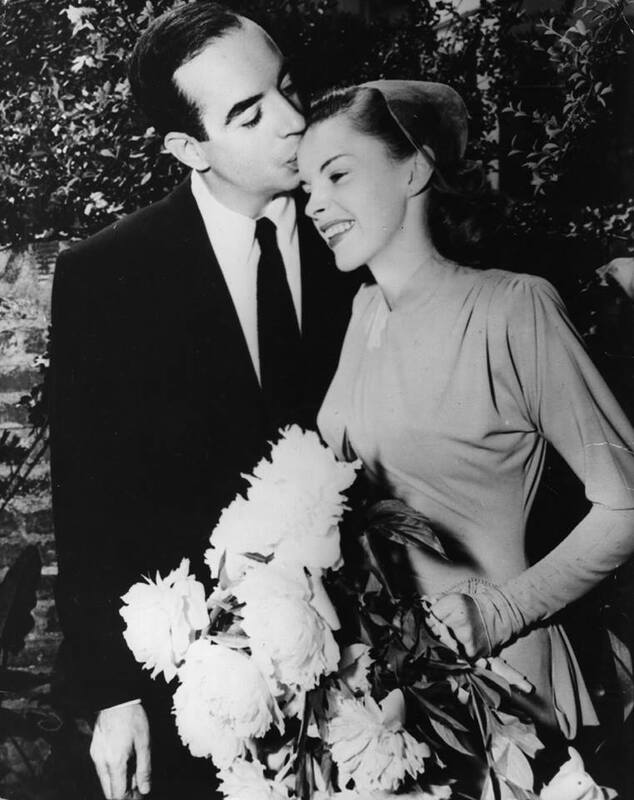 June 15, 1945: Judy married her second husband, Vincente Minnelli, at her mother’s home. 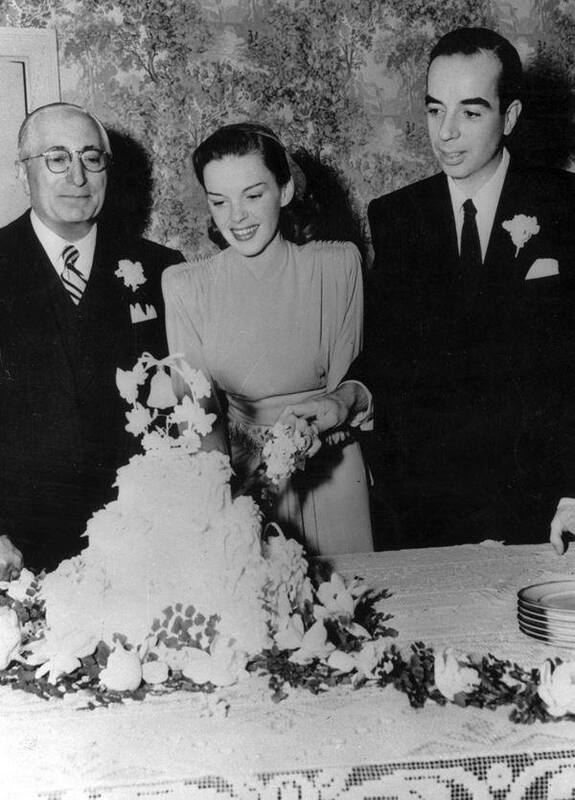 MGM Studios chief, Louis B. Mayer, gave the bride away. 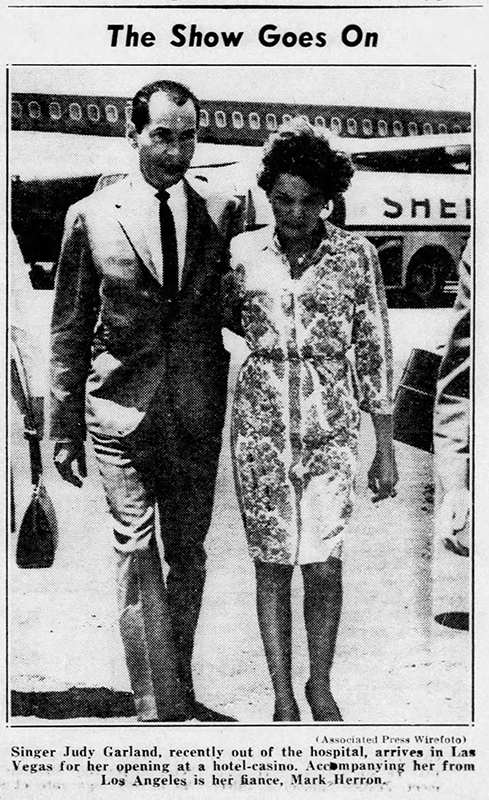 Judy and Vincente left that night on the Santa Fe Super Chief for their honeymoon in New York City. 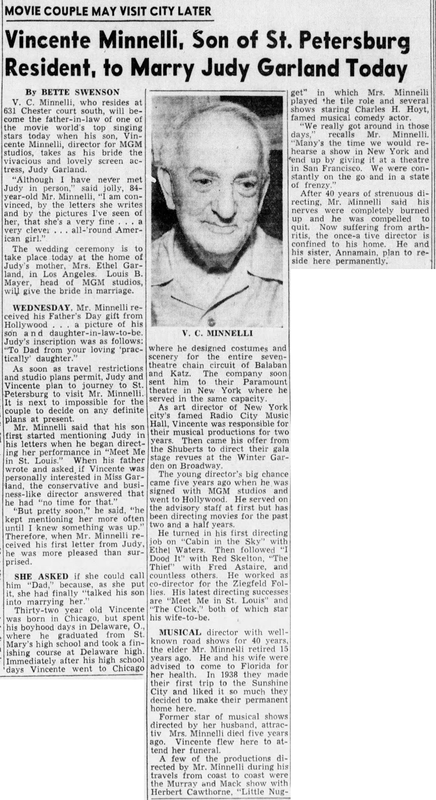 Also on June 15, 1945: This fascinating article about Vincente’s dad, V. C. (Vincent [without the “e” at the end]) Charles Minnelli, which includes this rare photo. 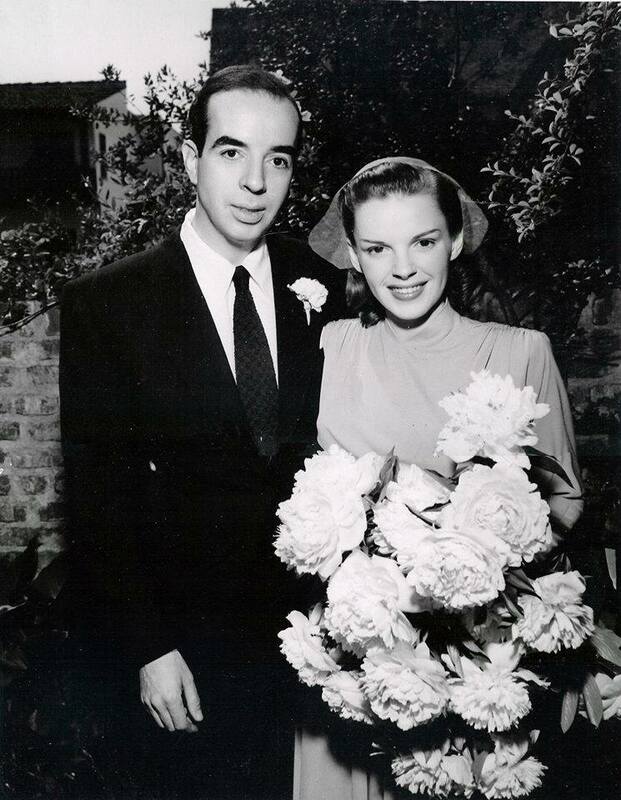 Although they were originally from the midwest (Vincente was born in Chicago), the elder Minnelli and his late wife (Marie, stage name Mina Gennell) had settled in St. Petersburg, Florida, five years prior for Mrs. Minnelli’s health. 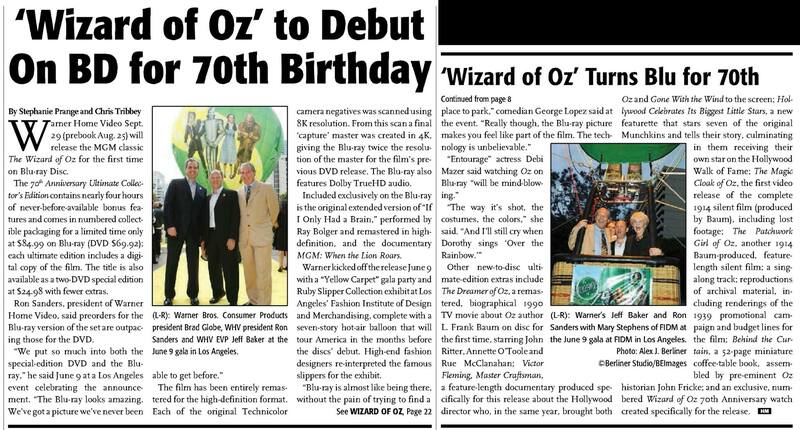 The article provides some great details about V.C.’s career as a director, like his son. Click on the image to read the article. 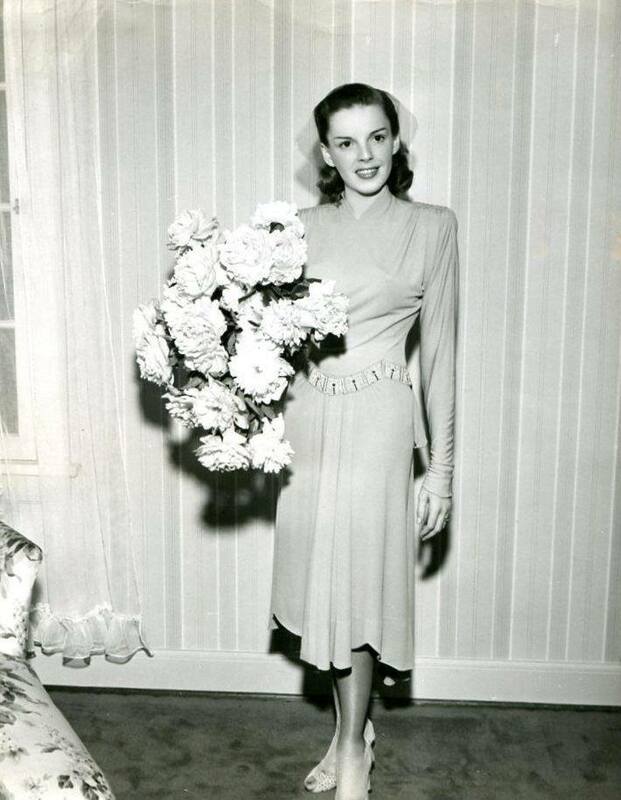 On this day, Judy was in rehearsals for The Barkleys of Broadway. Time called: 1:30 p.m.; Judy arrived on time; dismissed 5:15 .m. 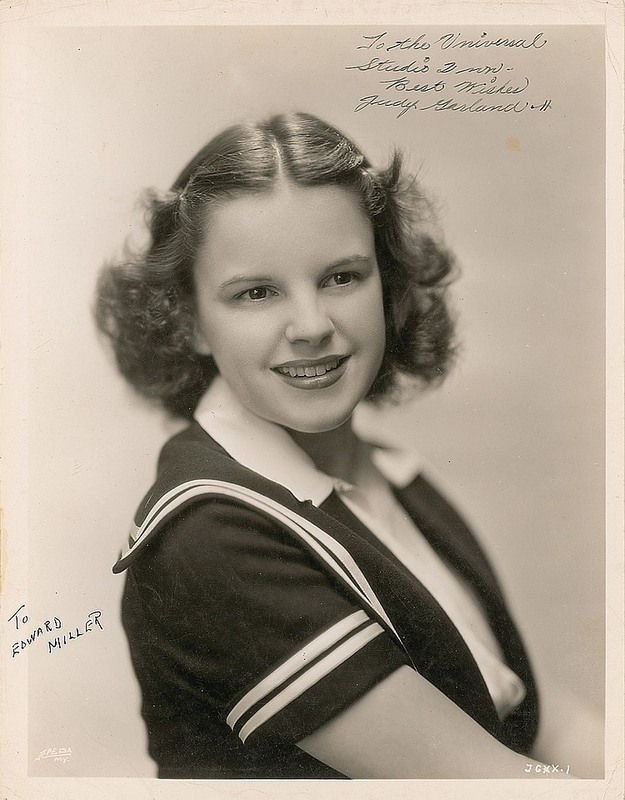 Check out The Judy Room’s “Films That Got Away” section for details about The Barkleys of Broadway. 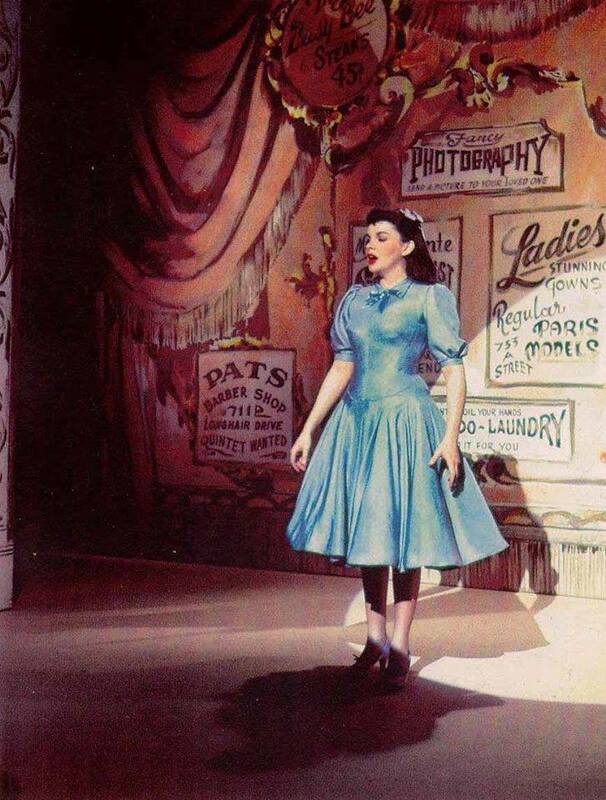 June 15, 1954: Judy pre-recorded “I’ll Get By” and “You Took Advantage of Me” for the “Born in a Trunk” number for A Star Is Born. 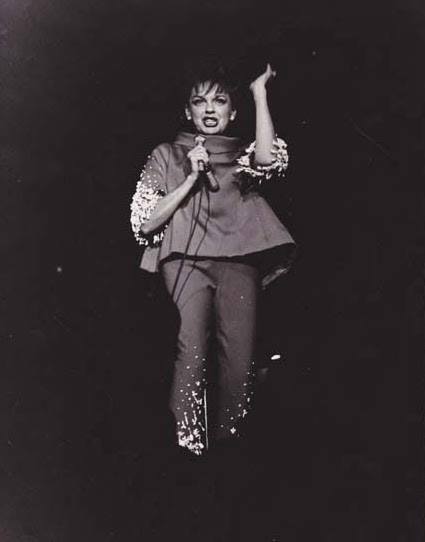 Time started: 2 p.m.; finished at 4:45 p.m.
After the pre-recordings, Judy then rehearsed more of the “Born in a Trunk” number until 5:30 p.m.
June 15, 1965: Judy was released from USLA (she had suffered an allergic reaction to prescription medications on June 12th) and immediately flew to Las Vegas for her opening night at The Thunderbird Hotel in Las Vegas, Nevada. 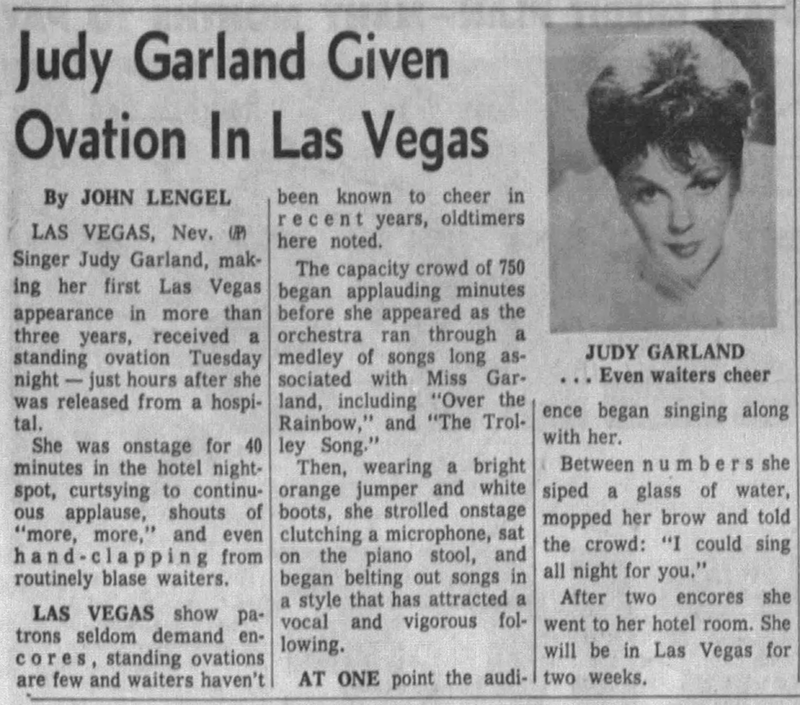 Judy’s two-week engagement outdrew every other hotel on the strip and garnered, again, amazing reviews. 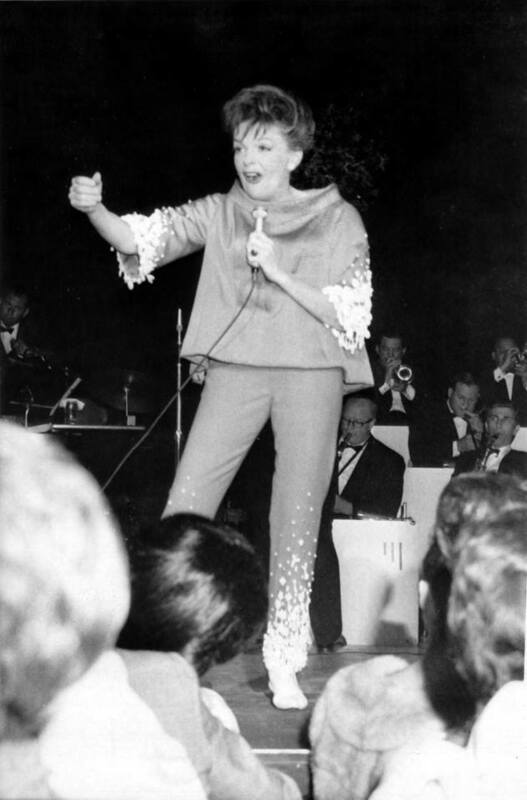 Judy’s shows started at 10:30 p.m. and she was backed by the Allen Brothers and a 31 piece orchestra under the direction of Nick Perito. This audio was recorded on opening night (June 15) (zip file). 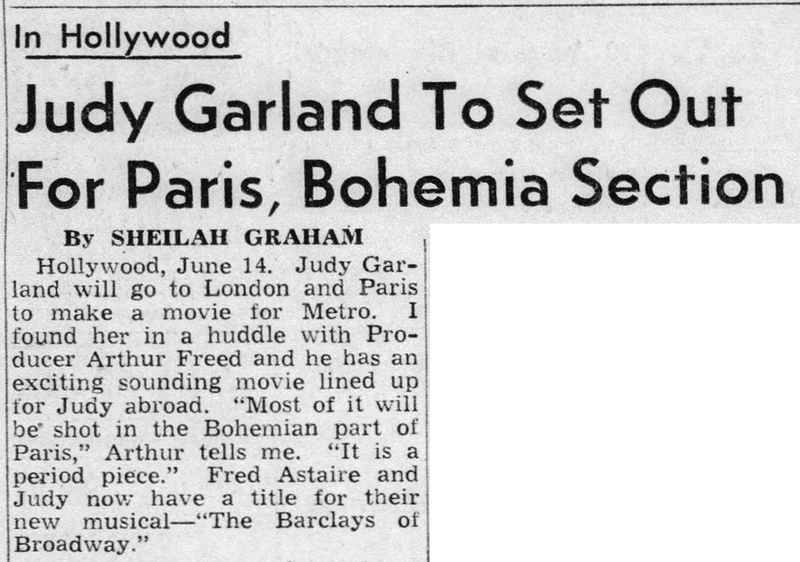 June 15, 1969: The last time Judy sang on stage. 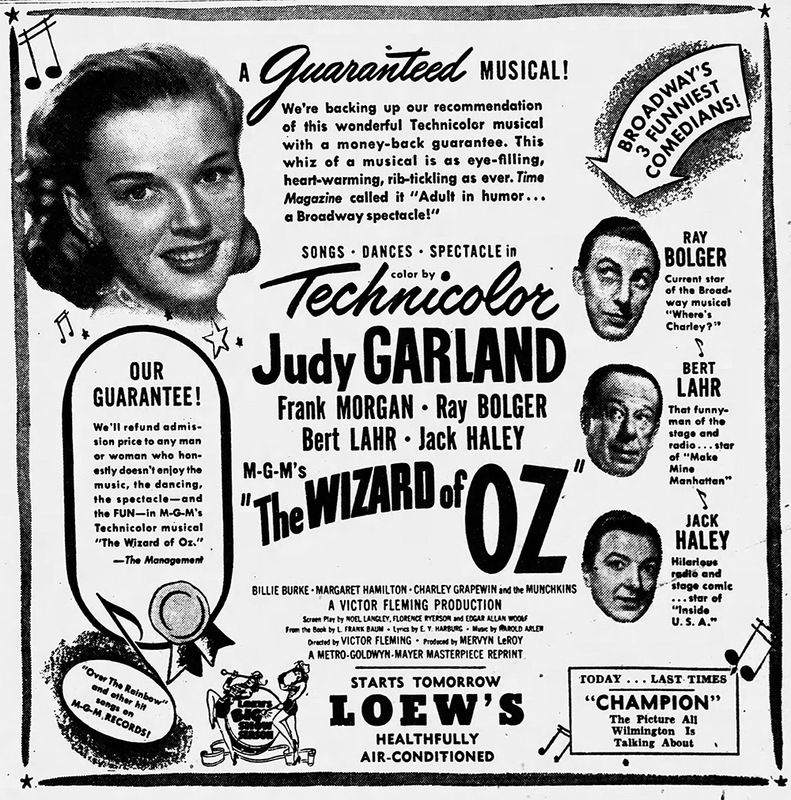 Unfortunately, the extended “If I Only Had A Brain” was not remastered into high definition as touted in this article and other press releases. When the set was re-released with new packaging and new collectibles in 2013 for the 75th anniversary it was still in standard definition. Check out The Judy Room’s DVD page with details about this release and tons of photos of the various versions here.